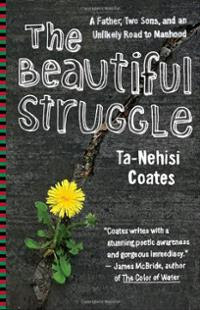 Over the years, in my African American literature courses, Colson Whitehead's The Intuitionist (1999) and now Ta-Nehisi Coates's The Beautiful Struggle have become part of the regular rotations in the grouping of classes that I teach. Whitehead's novel shows up in my upper level literature classes, and we cover Coates's book in my Malcolm X class and the class I teach for first-year black men college students. I've taught the books several times, and plan to teach them more, especially since they keep prompting such important learning experiences. This past spring, the guys in the first-year course really enjoyed Coates's book to a degree that really fascinated me. In our many discussions working through the book, we kept returning to versions of two central questions: 1.) What does it mean to be a young black boy growing up in a troubled environment? 2.) What's up with this thing called "consciousness"? Coates grew up in Baltimore, and among other things, he writes about the struggle of growing up amid violence and the effects of drugs and other crime on his neighborhood. More than half of the young men in our class are from or near Chicago, and given the tough, depressing circumstances of the city, those Chicago guys in our group really felt a deep connection with Coates based on what he describes concerning his childhood and neighborhood. Whereas the brothers acknowledged many connections to Coates, they were also intrigued about differences, which for our discussions, often revolved around this strange word "conscious" and the related concepts routinely mentioned in the book. Beyond mentions here and there to "conscious rappers," discussions about consciousness have not reached the guys as they did when Coates was coming of age. The guys asked me to tell them more about conscious rappers from "back in the day" (the 80s and early 90s) and the widespread or at least wider spread discussion of "deep" books, intellectualism, and radicalism among previous generations of black men in particular. Coates's discussions of consciousness linked to rap music as well as to discussions with his father about ideas and books. One day, we were talking about how close Coates had to be with his father in order to know and then relay some of the stories about his father's childhood, and I asked, by a show of hands, how many of the guys had similar relationships with their fathers. Not a single hand went up. I was somewhat taken aback that none of the 18 fellas in the room could attest to having a really good or even somewhat good relationship with their fathers. During wrap-up discussions of the book toward the end of the semester, a couple of the guys mentioned that they appreciated that Coates had told "our side of the story" by explaining the tough experience of growing up in certain neighborhoods. And more than a few guys pointed out that Coates's focus on "consciousness" was one of the most important topics that we had covered the entire year. Funny how their intrigue with consciousness in so many ways enhanced and renewed my interest in the concept.